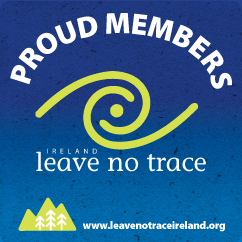 If you would like to share your experience of the Ireland Way trail we will happily feature your blog, photos, fundraiser details or video here! Starting on 30th October 2017 brothers Marc and Tom from Austria walked the Ireland Way and fundraised for the Capuchin Day Centre for Homeless People in Dublin and Caritas in Austria. They completed the through-hike in 36 days. Maysen Forbes completed the Ireland Way on 30 October 2017. As she walked, Maysen discussed her experience with mental health issues and raised over €2,000 for Mental Health Ireland. Well done Maysen! Read the blog of Corinne Cooley in which she gives a wonderful description and photographs of her journey walking the Beara-Breifne Way (stages 1 - 12) in May 2016. Breifne walked the Beara-Breifne Way (Stages 1 - 12) starting 31st Decemeber 2016, exactly 414 years since Donal Cam O'Sullivan Beare and his 1000 followers fled the Beara peninsula in county Cork to the Breifne region of county Leitrim. Share your photos on our Facebook Group Page and we will include some of them on here too!